A recent Pew study found that white American Evangelical Christians think they experience more discrimination than Blacks, Hispanics, Muslims, Atheists or Jews. Christianity is the majority religion in the U.S. and many kinds of legally ensconced religious privilege are on the rise including the right to woo converts in public grade schools, speculate in real estate tax-free, repair religious facilities with public dollars, or opt out of civil rights laws and civic responsibilities that otherwise apply to all. By contrast atheists are less electable than even philanderers, weed smokers or gays; Hispanics and Muslims are being told to leave; Jews get accused of everything from secret economic cabals to destroying America’s military; and unarmed Black youth continue to die at the hands of vigilantes. Given the reality of other people’s lives, a widespread Evangelical perception of their group as mass victims reveals a lack of empathy that should make thoughtful believers cringe. And indeed, Alan Nobel, managing editor of Christ and Pop Culture, and a professor at Oklahoma Baptist University, wrote a pained analysis this summer of what he called Evangelical persecution complex. Nobel contrasted the privileged position of American Christians with the real and serious persecution Christian minorities experience under ISIS, for example, and he examined the ways in which victimization can become a part of Christian identity to the detriment of Christians and outsiders alike. What he neglected to spell out clearly was the extent to which the Bible itself sets up this problem. Christianity, born in the harsh desert cultures of the Middle East, got its start by defining itself in opposition to both Judaism and the surrounding pagan religions of the Roman empire. Consequently, from the get-go teachings emerged that helped believers deal with the inevitable conflict, by both predicting and glorifying suffering at the hands of outsiders. 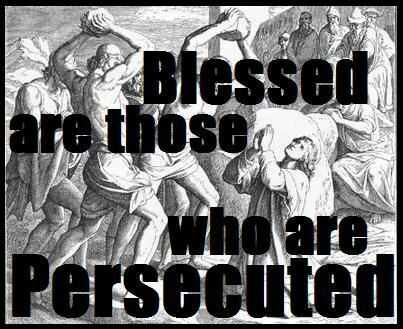 Indeed, persecution was framed as making believers more righteous, more like their suffering savior. Long before the Catholic Church made saints out of martyrs, a myriad of texts encouraged believers to embrace suffering or persecution, or even to bring it on. This sample from a much longer list of New Testament verses about persecution (over 100), gives a sense of how endemic persecution is to the biblical world view. As any squabbling pair of siblings can tell you, claiming to be a victim is powerful stuff, even if you actually struck first. He started it! yells one kid. No, she started it! yells the other. Parental resolve waivers in the face of uncertainty, and both kids get an exasperated lecture. When I was in college, I had a friend who grew up in a rough low income neighborhood. One day we got started talking about car accidents and he said, “My father told me that if you ever get in an accident, you should immediately get out and start yelling at the other driver. Even if it was your fault, it will put them on the defensive and keep them from making wild claims. And maybe the police will believe you.” Amoral, perhaps but brilliant. If claiming to be a victim is powerful, believing you are a victim is far more so, again regardless of the actual facts—which, at any rate, we all are prone to interpret through a self-serving lens. Have you ever noticed that when your friends tell you about conflict with co-workers or lovers, you almost always feel like they got wronged? What are the odds, really? Seeing ourselves and our tribe as innocent victims draws sympathy and support, and it protects self- esteem. When we cultivate the sense that we have been wronged, we can’t see the wrong that we ourselves are doing. We also give up our power to make things better. If people keep being mean to us through no fault of our own, then we’re helpless as well as victims, at least in our own minds. You can’t fix what you can’t see. 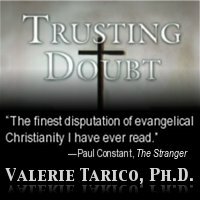 In the case of Christianity, the theology of persecution serves to give the faithful hope. It inspires persistence in the face of hardship, including the many hardships that life brings on all of us through no fault of our own. But it has also blinded generations of believers to the possibility that sometimes the hardships they face are due not to their faith or evildoers hating Jesus, but to the fact that they hit first. And sometimes the bewildering hostility they perceive may simply be something that the theology of persecution set them up to expect, whether it is there or not. Hey, Christians. Don’t Be Evil! Gallery | This entry was posted in Musings & Rants: Christianity and tagged biblical literalism, bibliolatry, Christian fundamentalism. Bookmark the permalink. Thank you for the tip! I’ll check out John’s piece. Brilliant. Superb piece! There has been an uptick in the “Woo me!” coming from the right wing, which is astounding considering Justice Scalia only last week proclaimed the government had every right to favour Christianity. Mind-bending! excellent exposé on these inner workings within Christianity. This is how I also was raised. To be “insulted” was a badge of honor to wear and feel proud of and though i didn’t go out of my way to be obnoxious, I collected them “knowing” God was pleased. In a “fallen world” under the domain of Spiritual Darkness, being persecuted confirms one that they are on the right side fighting evil. Having said this we SHOULD ALL feel proud for standing up against racism, sexism, and any abuse, and if we ARE as human beings persecuted, then any scars ARE a badge of honor. I personally think that Right-wing evangelical fundamentalist Christians (in the US that is) feel persecuted when they are not allowed to round up their perceived enemies – homosexuals, lesbians, any kind of transgendered, abortionists and those seeking abortions, atheists and such like and simply lynch them all. It’s a shame, really, that the law is so wishy-washy on the matter. Shouldn’t those who know God’s will, have God’s truth by proper interpretation of the Bible have a free hand in deciding who deserves to live, who deserves to die? Besides, there’s all that property belonging to those godless types which should, by divine right, belong to God’s own children – it’s in the Bible, after all. Yep, I certainly can feel their sense of being deprived their entitlement. I think that right-thinking Americans, particularly those who are persecuting the poor RWEFC’s by taking advantage of the system and living a normal life, should turn their properties and families over to them and stop this terrible unfairness. Reblogged this on Lo, behold, I eat water-mellon. If I remember my history, the nascent Nazis of 1930 Germany practiced this same sense of being persecuted which consequently gave them the right to attack and destroy those they felt persecuted by. Christianity followed the same pattern only it took a couple of hundred years for it to get even with its “persecutors” instead of a couple of decades. It’s a pattern in the sociopath mind. In my experience, when enduring real persecution and responding with understanding, tolerance and love, more often than not the “persecutors” see a mirror of themselves and begin to feel shame. I have seen the attacks stop and subsequently received heart-felt apologies. But when the perceived persecution is due to one’s own evil, the compassionate transfer cannot happen and the evil is compounded. I think that “non-believers” need to rethink their strategies regarding the rise of Christian Nazism in the US. It’s now the non-believers who need to demonstrate love, understanding and practice satyagraha – definitely not an easy choice and definitely one that can seriously backfire if these sociopaths are beyond “redemption” as were/are Nazis and Ku Klux Klanners.